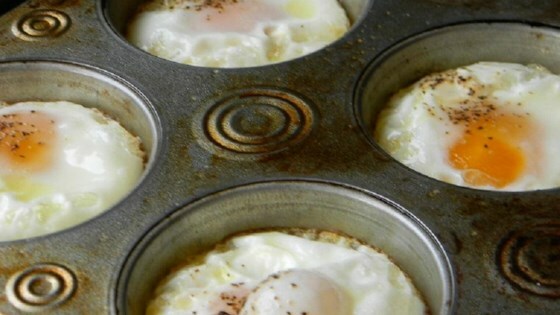 "Have you ever tried eggs on the grill by using a muffin pan? Just spray the pan and crack the eggs and put them on the grill. Try adding some chopped peppers and onions or anything to your liking." Preheat an outdoor grill for medium high heat. Awesome for when you go camping & no mess & fuss! We have made this Extravagant delicacy 10 times since we found the recipe' yesterday!! this works great when camping! to make clean up even easier we got disposable foil muffin pans, greased them well and tossed them in the recycling bin when done. What a great idea for tailgates. Just pack some english muffins, some cheese and some ham. You have excellent breakfast sandwiches to get you through those early morning pre-games. Great idea!!! I was looking for a way to cook eggs at work in the toaster oven and this works perfectly. Thanks.